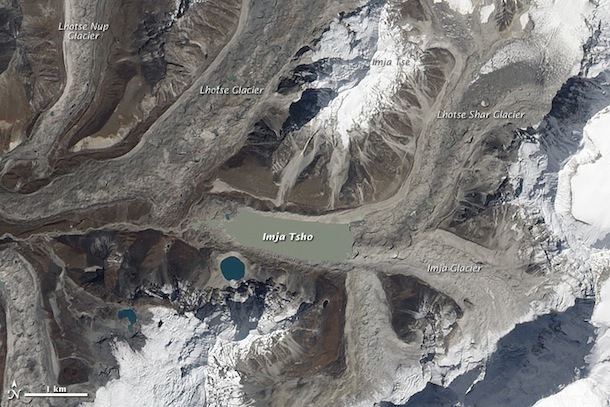 Himalayan glaciers feed rivers and lakes across South Asia that more than a billion people depend upon for fresh water. It’s for this reason – and the fact that many have experienced rapid changes in recent decades – that scientists keep an especially watchful eye on ice in the region. Much of the data collected to date suggests the prognosis isn’t good. As Goddard Space Flight Center atmospheric scientist William Lau detailed during a presentation at the American Geophysical Union’s fall meeting, air temperatures in the region have been rising at more than 5 times the rate of global warming. And at high elevations in the eastern Himalayas glaciers have been observed retreating by about 1 percent per decade for the last twenty to thirty years. (In contrast, glaciers in the western Himalayas have been relatively stable). Though greenhouse gases are responsible for part of the warming, Lau’s research finds that two major processes, both associated with airborne particles called aerosols, also play a critical role. The first, a meteorological hypothesis known as the elevated head pump, involves a shift in the monsoon cycle driven by pollution and dust in the region that Lau’s modeling shows brings warmer and wetter conditions to the Himalayan Plateau. The second involves the deposition of dark particles on snow surfaces so that they decrease the albedo and increase temperatures. Text by Adam Voiland. 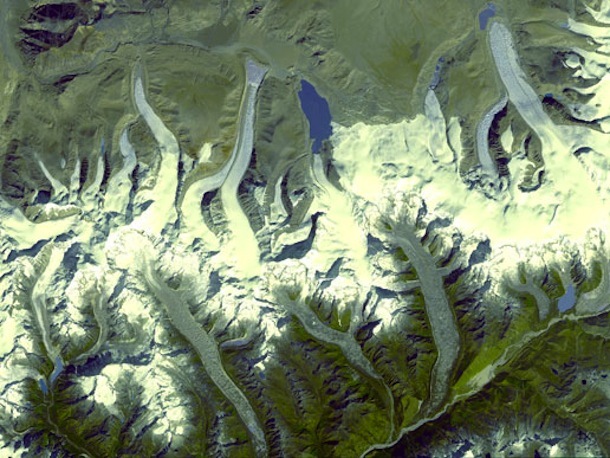 Satellite image of glaciers in Bhutan (top) originally published by NASA’s Earth Observatory. Image pair showing clean and dust-laden regions courtesy of William Lau. The 2011 La Niña, one of the strongest in recent decades, absorbed so much moisture from the oceans and dropped it as precipitation over northern parts of Australia and South America that global mean sea levels fell by about half a centimeter. 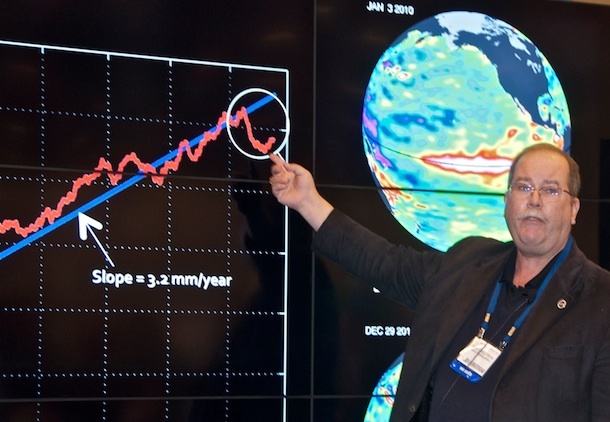 That was the key point that Eric Lindstrom, an oceanographer based at NASA headquarters, made today while giving a presentation at NASA’s outreach booth at the American Geophysical Union’s fall meeting. He gave the talk with the help of a sophisticated visualization system — called the Hyperwall — that’s capable of displaying large sets of data. The system consists of nine 42-50“ flat-screen monitors arranged in a 3 X 3 array. 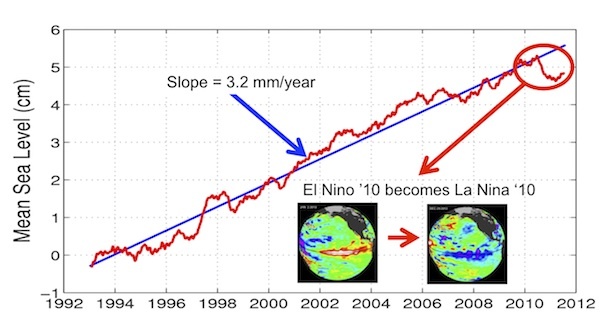 As Lindstrom pointed out, the fast transition from the 2009-10 El Niño to the 2010-11 La Niña triggered changes in precipitation patterns across the tropics, transferring enough water over land to cause global mean sea level to fall during the spring and summer of 2011. Data from NASA’s GRACE and TRMM satellites have confirmed that the “extra” water and rain has ended up over land as freshwater (see below). The drop in sea level happened despite the background rate of global mean sea level rise, which has been fairly steady at 3.2 millimeters per year since the early 1990s. At AGU? Be sure and check out the ongoing exhibit activities (pdf) and full schedule of hyperwall presentations (pdf) at NASA’s exhibit (#1637). All the figures shown in this post are available in the Dynamic Oceans presentation on the Earth Observing System’s Hyperwall page. Blog text by Heather Hyre. Photo by Winnie Humberson. 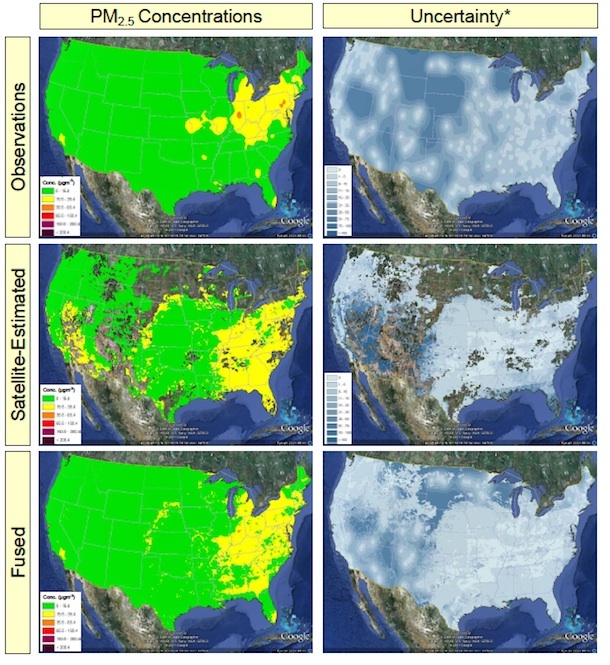 To What Degree is Extreme Weather Linked to Climate Change? As flood waters continue to inundate Thailand and drought parches Texas, the Intergovernmental Panel on Climate Change and Goddard Institute for Space Studies Director James Hansen have both released new statements about the connection between extreme weather and climate change. Although linking extreme weather to climate change has generated controversy in the past, both of the new reports point plainly to a connection.The IPCC, an international organizational that represents the scientific consensus of hundreds of leading climatologists, put it this way in the executive summary of its new report. It is very likely that there has been an overall decrease in the number of cold days and nights, and an overall increase in the number of warm days and nights, on the global scale, i.e., for most land areas with sufficient data. 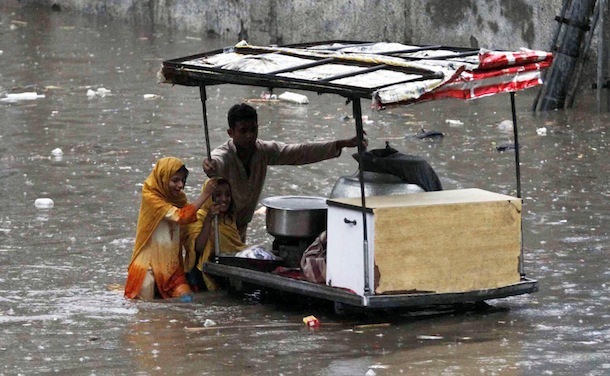 It is likely that these changes have also occurred at the continental scale in North America, Europe, and Australia.There have been statistically significant trends in the number of heavy precipitation events in some regions. It is likely that more of these regions have experienced increases than decreases, although there are strong regional and subregional variations in these trends. There is medium confidence that some regions of the world have experienced more intense and longer droughts, in particular in southern Europe and West Africa, but in some regions droughts have become less frequent, less intense, or shorter, e.g., in central North America and northwestern Australia.There is evidence that some extremes have changed as a result of anthropogenic influences, including increases in atmospheric concentrations of greenhouse gases. It is likely that anthropogenic influences have led to warming of extreme daily minimum and maximum temperatures on the global scale. There is medium confidence that anthropogenic influences have contributed to intensification of extreme precipitation on the global scale. The “climate dice” describing the chance of an unusually warm or cool season, relative to the climatology of 1951-1980, have progressively become more “loaded” during the past 30 years, coincident with increased global warming. The most dramatic and important change of the climate dice is the appearance of a new category of extreme climate outliers. 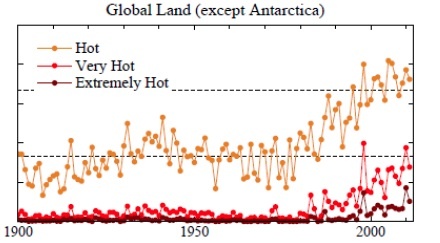 These extremes were practically absent in the period of climatology, covering much less than 1% of Earth’s surface. Now summertime extremely hot outliers, more than three standard deviations (σ) warmer than climatology, typically cover about 10% of the land area. 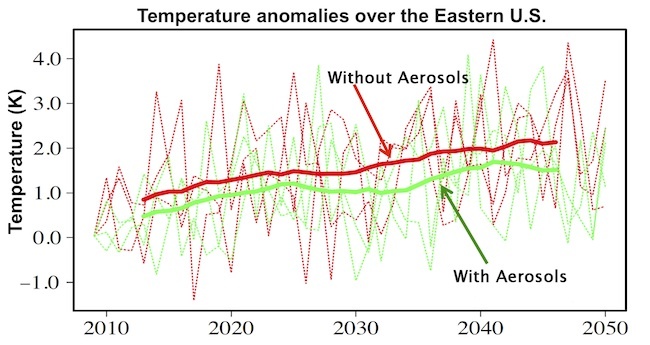 Thus there is no need to equivocate about the summer heat waves in Texas in 2011 and Moscow in 2010, which exceeded 3σ – it is nearly certain that they would not have occurred in the absence of global warming. If global warming is not slowed from its current pace, by mid-century 3σ events will be the new norm and 5σ events will be common. Text by Adam Voiland. 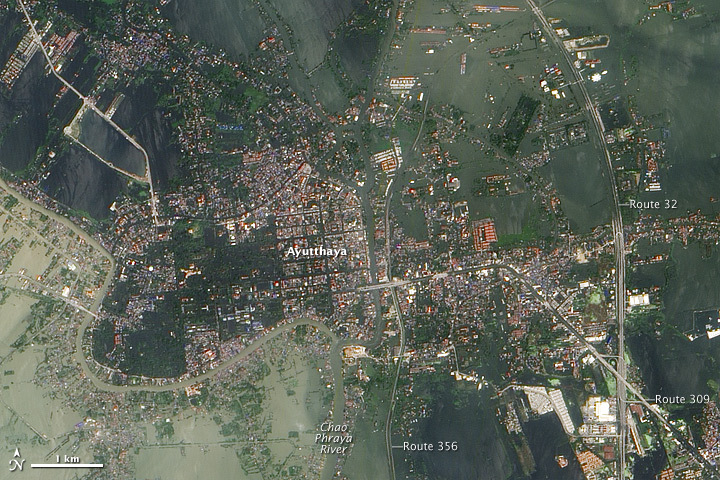 Lead image of flooding in Ayutthaya published originally by NASA’s Earth Observatory. 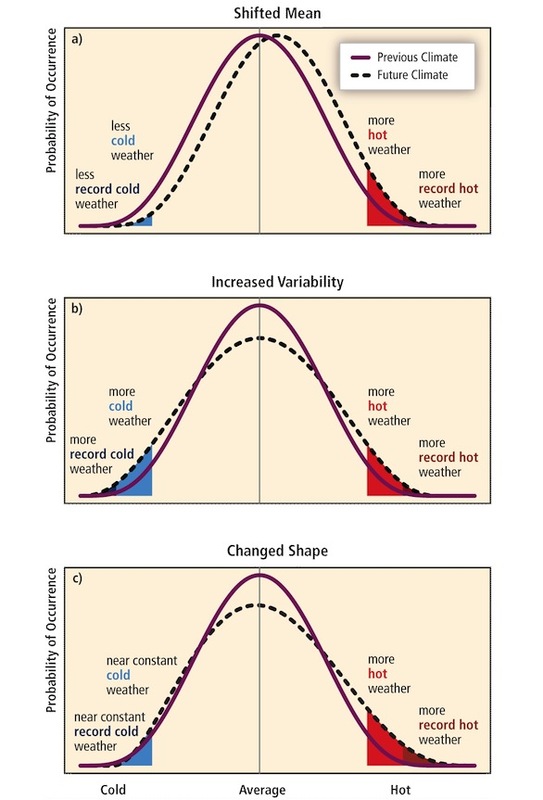 Extreme weather curves published originally by the IPCC. 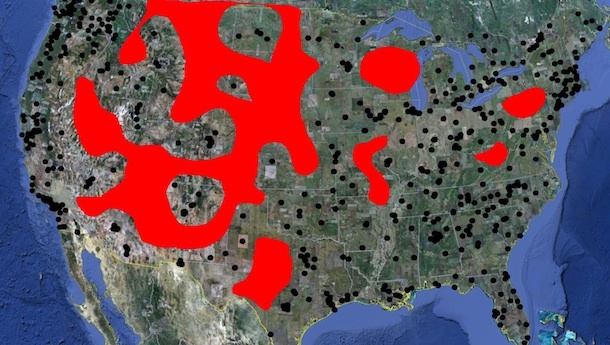 Land trends over land published originally on James Hansen’s Columbia University website. Author avoilandPosted on December 6, 2011 March 8, 2013 Tags climate change, General, meteorology, rain, temperature, weather2 Comments on To What Degree is Extreme Weather Linked to Climate Change? Ben Cook, a Goddard Institute for Space Studies climatologist, presented new evidence at the American Geophysical Union meeting in San Francisco that widespread deforestation amplified ancient droughts in Central America. Read more about it here. Video by Kavyon Sharghi from NASA’s Goddard Space Flight Center. NASA recently posted a press release about an upcoming expedition to Pine Island Glacier Ice Shelf, a key piece of real estate in Antarctica that’s slipping into the ocean at an increasingly worrisome pace. This month, in fact, an aircraft participating in Operation IceBridge spotted a lengthy crack cutting across the massive sheet of floating ice. There wasn’t much room for many details in the release, so here’s a longer description of the upcoming expedition from Goddard’s cryosphere writer, María José Viñas, for polar science aficionados. An international team of researchers will helicopter onto thePine Island Glacier ice shelf, one of Antarctica’s most active, remote andharsh spots, in mid-December — weather permitting. Their objective: to determinehow changes in the waters circulating under the fast-melting ice sheet arecausing the glacier to accelerate and drain into the sea. If all goes to plan,the multidisciplinary group of 13 scientists, led by NASA’s emeritusglaciologist Robert Bindschadler and funded by the National Science Foundation(NSF) and NASA, will depart from McMurdo stationin mid-December and spend six weeks on the ice shelf. The team will use acombination of traditional tools and sophisticated new oceanographicinstruments to measure the ocean cavity shape underneath the ice shelf. Theyaim to determine how streams of warm water enter this cavity, move toward thevery bottom of the glacier and melt its underbelly, making it dump more than 19cubic miles of ice into the ocean each year. Pine Island Glacier has long been on the radar screen of Antarcticresearchers. “Once satellite measurementsof Antarctica started to accumulate and we began to see which places werechanging, this area lit up as a spot where there was a large change going on,”Bindschadler said. Bindschadler was the first person to ever set foot on thisisolated, wind-stricken corner of the world in January 2008. 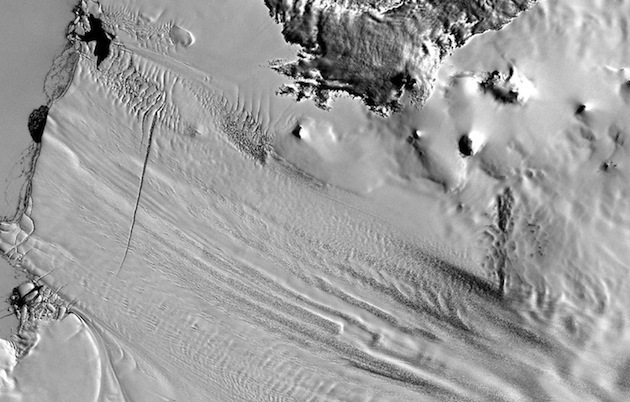 Previously,scientists doubted it was even possible to reach the crevasse-ridden ice shelf.But Bindschadler used satellite imagery to identify an area where planes couldland safely. The glaciologist’s joydidn’t last: the ground proved to be too hard for the planes transporting theinstruments to land repeatedly. Logistics experts determined they would have touse helicopters to transport scientists and instrumentation in and out the iceshelf, and the whole plan for field campaigns had to be redesigned around thehelicopters’ availability. Almost four years after thisfirst landing, Bindschadler and his team will be returning to the ice shelf tostudy its innards. Scientists have determined that it’s the interaction ofwinds, water and ice that’s driving ice loss. Gusts of increasingly stronger westerlywinds push the Antarctic Circumpolar Current’s cold surface waters away fromthe continent: then, warmer waters that normally hover at depths below thecontinental shelf rise. The lifting warm waters spill over the border of thecontinental shelf and move along the floor, all the way back to the groundingline—the spot where the glacier comes afloat— causing it to melt. The warmsalty waters and fresh glacier meltwater combine to make a lighter mixture thatrises along the underside of the ice shelf and moves back to the open ocean, meltingmore ice on its way out. But, how much more ice melts? Bindschadler and his team need to findout to improve projections of how the glacier will melt and contribute to sealevel rise. One of the first tasks for the teamwill be using a hot water drill to make a 500-meter deep hole through the iceshelf. Once the drill hits the ocean, the scientists will send a camera to peerinto the ocean cavity, observe the underbelly of the ice shelf and analyze theseabed lying 500 meters below the ice. Then, they will lower a setof instruments that Tim Stanton, an oceanographer with the Naval PostgraduateSchool, has built. The primary instrument in the package is an ocean profiler, which will move up and down avertical cable that connects it to a communication instrument package on thesurface of the ice shelf. As it moves, the profiler will measure temperature,salinity and currents from 3 meters below the ice to just above theseabed. It can also be instructed to park at specific depths and gauge waterturbulence and vertical transport of heat and salt along the water column. Thedevice will send all data to the surface tower that will then transmit it toStanton’s laboratory via a satellite phone. The profiler is controlled remotely, and Stanton can vary its sampling rate.It will initially do fast sampling,to observe daily changes in water properties and circulation withinthe ocean cavity. A second holewill support another instrument array similar to the profiler but fixed toa pole stuck to the underside of the ice shelf. 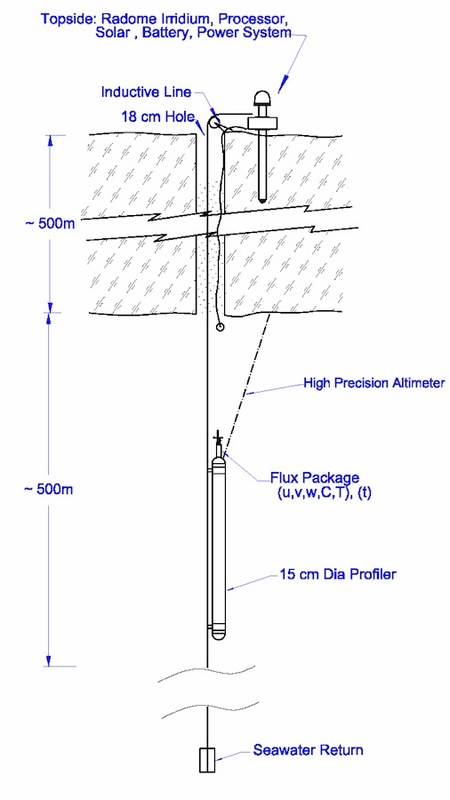 The fixed-depth flux packagewill make measurements very close to the interface where ice and water exchangeheat. Another gadget connected tothe fixed-depth package will be a string of 16 small temperaturesensors deployed within the lowermost ice to freeze in and become part of theice shelf. Their mission: to measure the vertical temperature profile,data that can tell scientists how fast heat is transmitted upwards through theice whenever hot flushes of water enter the ocean cavity. “Since the temperature of the ice shelf determines its strength, we hypothesizethat strength may decrease as warmmelting events occur within the ocean cavity,” Stanton said. Stanton plans on deploying up to two sets of instruments during this fieldseason, and a third one next year. “If we get one in, I’ll be happy. If I get two, I’ll be extraordinarily happy,”he said. One of the biggest challenges in building his pack of instruments,Stanton said, was designing it to fit the hole in the ice shelf, only 20centimeters wide and 500 meters long. A tight, long hole also means that theteam will only get one shot at deploying the instruments: once the package islowered into the ocean cavity, it cannot be pulled out. “I have been deploying instruments intoice floes in the Arctic for the last 10 years, so I got quite used tojust putting them in and turning on my heels and walking away. But it’s stillquite hard to do,” Stanton said. A geophysicist with Penn StateUniversity, Sridhar Anandakrishnan, will create tiny earthquakes to studythe shape of the ocean cavity and the properties of the bedrock under the PIGice shelf. 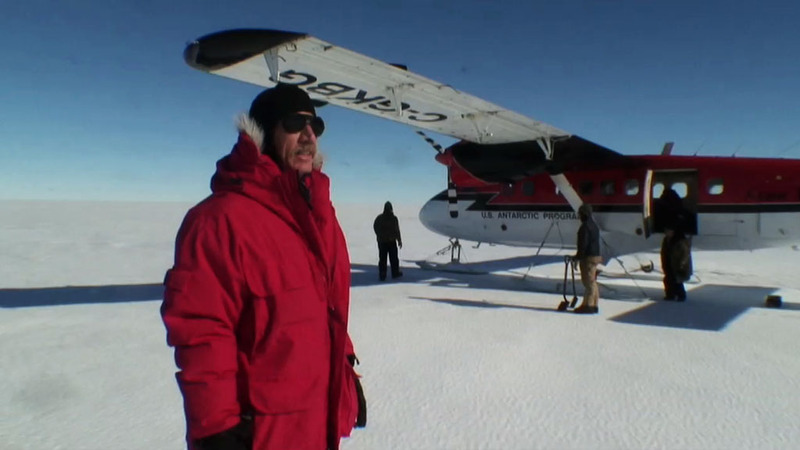 He will be doing measurements in about three-dozen spots in theglacier, using helicopters to hop from oneplace to another. Anandakrishnan’s technique, formally called reflectionseismology, involves generating waves of energy by setting up small explosionsor by using instruments similar to sledgehammers to bang the ice. He’ll recordhow long it takes for the waves to travelthrough ice and water, bounce off the seabed and return, and he’ll analyze thestrength of the echo. Both factors will tell him about the thickness of the iceand water. “[The technique] is identicalto the way bats and dolphins do echolocation: they send out a sound and listento the echo – both the time and direction of the echo tell them about thedistance to their prey,” he said. Anandakrishnan also wants tostudy the properties of the bedrock beneath the ice. “When glaciers are slidingover the bedrock, they do it very differently depending on whether it is roughor smooth,” he said. Finally, the geophysicistwill inspect a mysterious ridge that runs across the ocean cavity under the icesheet. This ridge was unknown to researchers when they designed their projectin the early 2000s; it wasn’t until 2009 that an unmanned submarine operated bythe British Antarctic Survey detected it. Its existence has made the scientistsrethink where they will place their oceanographic instruments under the iceshelf, so that they don’t hit the ridge while the glacier advances toward thesea. Text by Maria-José Viñas. Pine Island Glacier ice tongue image originally published on the Pine Ice Glacier Ice Shelf page. Image of Bob Bindschadler on the ice shelf originally published here. Ocean profiler image originally published on the Pine Island Oceanography Program website. Image of Sridhar Anandakrishnan originally posted by the National Science Foundation.